I was tickled pink when I got this lovely bundle in the mail to review! I am so happy to share what The Closet Pagan has available, and I am confident you will find something you’d love to have! Owner, and craftsperson Anna Pierce is a gifted jewelry maker, and she knows her stuff about what stones have which magical attributes, and she makes spell kits as well. She shipped me, as pictured, two different necklaces. One with crystal ball smoky quartz, and the other with the mysteriously beautiful bloodstone. 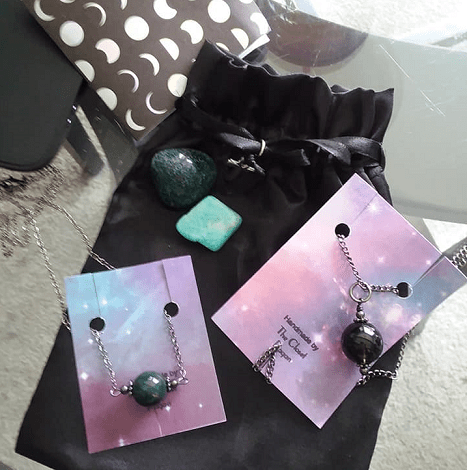 She also sent single amazonite and fancy jasper stones, and had them all put together in a gorgeous black silky drawstring bag complete with a lovely ankh charm. On review of her etsy page, I found lots to love. From silver charm necklaces, to crystal grid boards, and protection kits, this gal is stocked up with things every Witch and Pagan is sure to love. Even better, the prices are quite reasonable! I was lucky enough to be able to have a short interview with Anna as well! Saoirse– Bright Blessings, Anna! What beautiful products you have! I got the smoky quartz crystal ball necklace, and bloodstone necklace, and the fancy jasper and amazonite crystals. Such beautiful, thoughtful offerings! Thank you! Tell me the meaning behind all the stones from your own interpretations, and the magical and or healing properties you ascribe to them. Anna- The meaning behind the stones: Well, the smoky quartz, and bloodstone are some of my favorites. To me, they represent great emotional healing properties such as calming ones mind, and relieving stress. Of course, all of this I believe, is from the power of suggestion, but it’s something that can make you feel great while rocking a cute piece of jewelry. Saoirse– Tell me how you got into making jewelry and spell kits? What made you decide to do an online shop? Do you have a brick and mortar shop customers may visit, or is it all online? Anna- My shop is online on Etsy only. I’d love to one day have a brick and mortar shop, but unless I win the lotto, I don’t see it happening any time soon unfortunately. How I got into jewelry making and spell kits: Well, I really love the idea of unusual items and products to make you feel better. Spell kits/ornaments stuff I make I like to use as my own home decor and wanted to share my interests with anyone who would appreciate them. The jewelry making, I picked it up as a hobby then decided to just take a leap and go for it. ? Saoirse– What is your personal spiritual and or magical path, and how does your merchandise support you in that? Anna- I consider myself a Pagan Eclectic Witch. I am not a Wiccan, and do not follow any kind of “Witch’s code.” My merchandise supports in the fact that I have a bunch of different styles and try to keep it simple. Saoirse– What power is there in personal adornment with magical materials like oils, and jewelry, in your opinion? Anna– I believe it’s all the power of suggestion, and the energy you send out onto the Universe. Saoirse– What are your personal favorite things to make, and what are your personal favorite materials to use, and why? Anna– My personal favorites to make are the ornaments and spell sets, because I can offer a variety of different items in one grouping. Saoirse– Tell me about something extra special you have made, and how, and why it is meaningful to you? Anna– Something extra special? I suppose that’ll have to be the Winter Solstice ornaments I made, because it allowed me to fill the bulbs with beautiful flowers to decorate your home or holiday tree. When making them I send out good energy into the Universe. Anna is a real person, and is not just looking to earn money. She encourages people to reach out to her through her Instagram, and she loves people to tell her about themselves. She is very relatable, and tries to inspire whenever she can. Happy shopping, and Blessed Be!